DAY 48 -- After a pretty lazy morning around my dad's house, we headed out on a short drive north to the Ballard Nature Center in Altamont, IL. Having never heard of this place before, we weren't quite sure what to expect but were pleasantly surprised with the playground, the trails, and especially the visitor's center full of things for the kids to discover. It should come as no surprise that we stopped at the nearby flea market as we left the park. From the road, this storage unit market had a lot of promise but was a total disappointment once we got there. Imagine a flea market made up of people selling trinkets you'd find at a county fair and others selling rusty garbage they consider a goldmine but should actually be dropped off at the nearest dump. The kids did get to see Mater while we were there though. 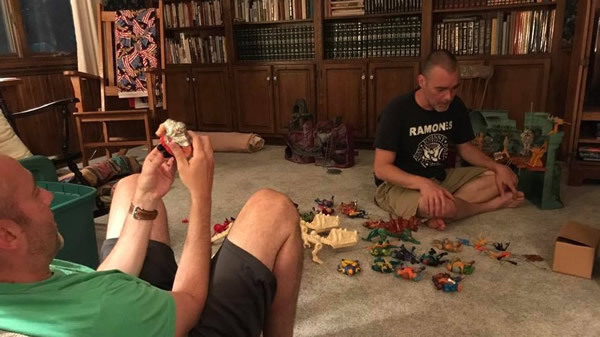 My brother joined us for dinner at my dad's and that's where things got interesting as he informed me that he was planning to sell off his childhood Masters of the Universe collection. When I expressed an interest in taking it all off his hands the negotiations began as we put together a rough estimate of the collection's value.